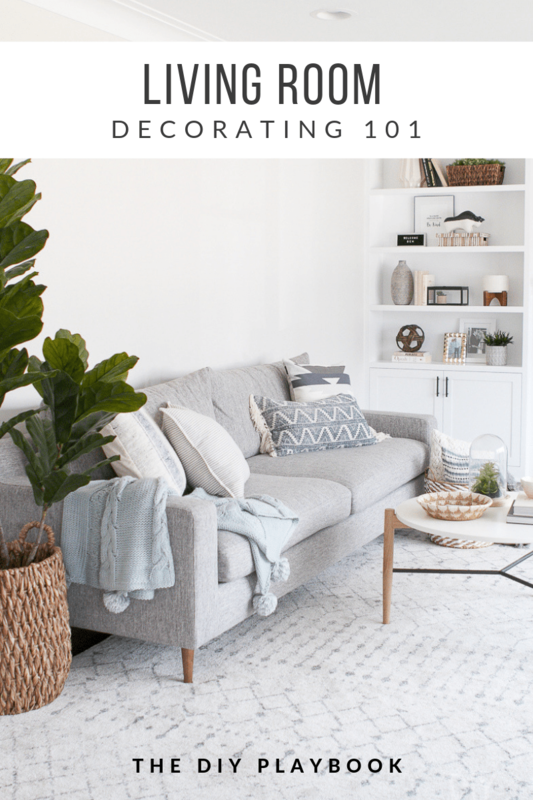 We’re back with another post in our room decorating 101 series! While we aren’t design experts, we have learned a lot over the last 6 years about how to (and how not to!) bring a space together. Our plan is to tackle a different room in the house every month, so by the end of the year, you’ll have a comprehensive guide to decorating the home of your dreams. Last time, we gave you the ins and outs on decorating a bedroom. Today’s topic? 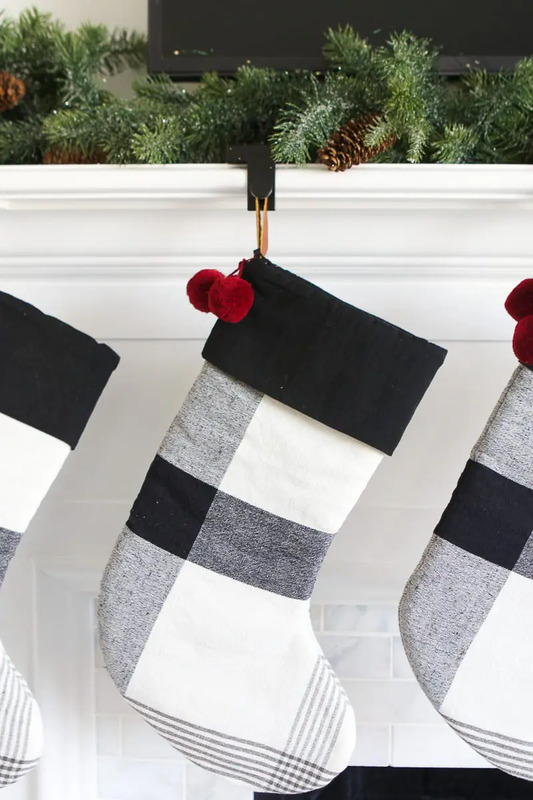 Living room decorating 101! Buy a Large Rug – You’ve heard it from us a million times, too small rugs are a big no-no in our playbook! In fact, this topic even made for a great rookie mistake post. In your living room, you’ll probably need a big rug! You want at least the front legs of the sofa and chairs to rest on top of it. Have Enough Seating – We’re guessing most living rooms have couches or sectionals but don’t forget about additional seating. 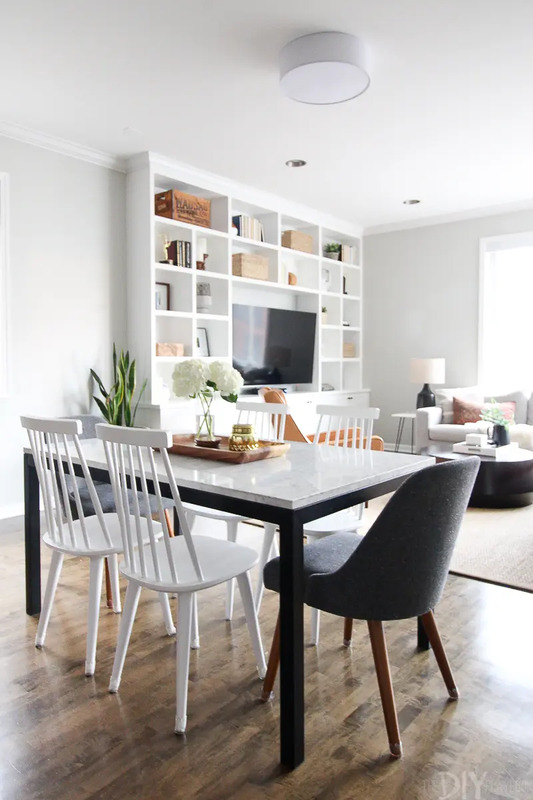 Adding a chair or two can make the space much more conversation-friendly. 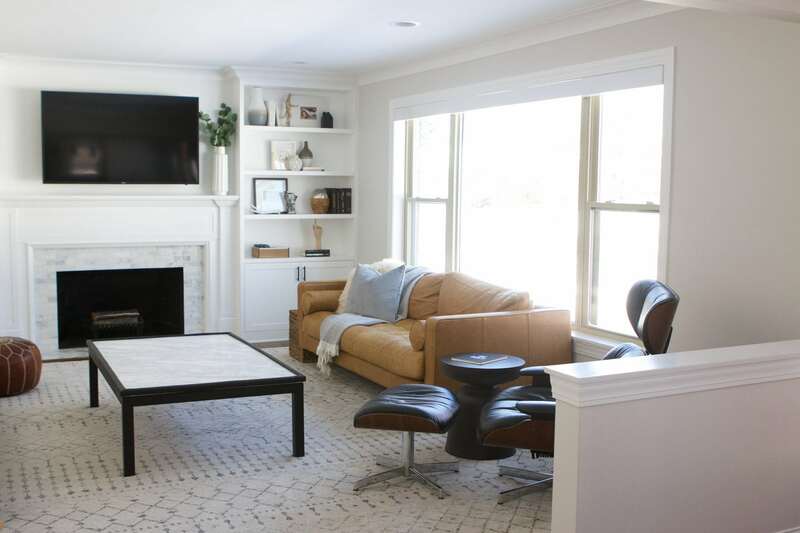 Of course, you don’t want to overcrowd a room with furniture, but often times there’s room for a comfy chair to sit across from the couch or main seating area. Use Secret Storage – We’ve both been in many living rooms that have way too much stuff everywhere. Accessories on every surface, toys, books, etc. Instead, only highlight items that you really love and keep everything else hidden away. 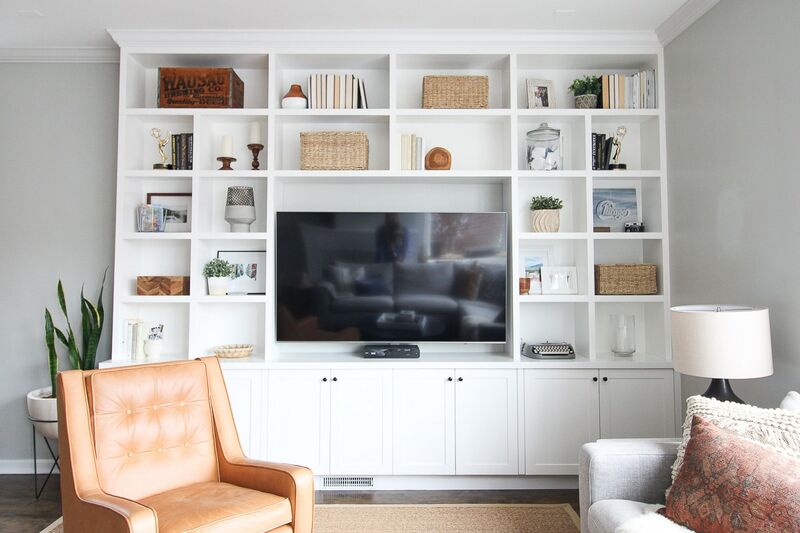 Our built-ins have tons of storage for the not-so-pretty stuff, and then we display our favorite accessories out on the shelves. Whether it’s bookshelves, built-ins, or a bench with storage make sure you invest in some sort of hidden storage. 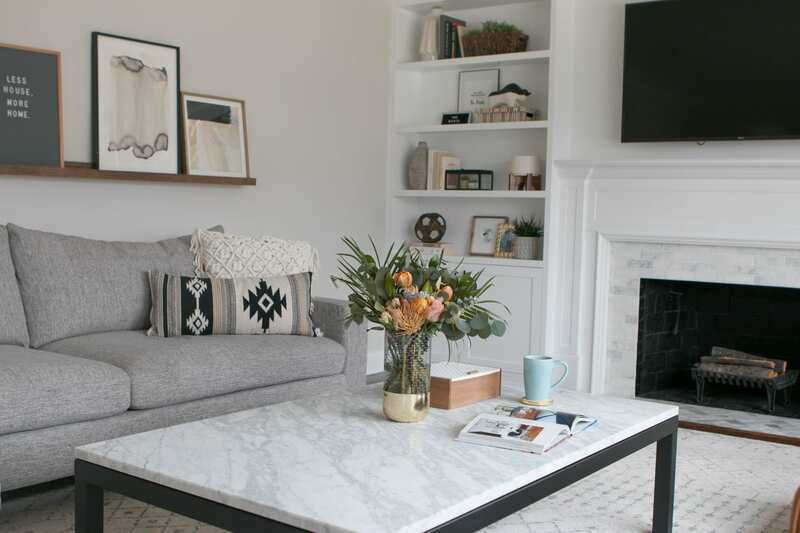 Buy the Right Coffee Table – We see coffee tables that are the wrong scale all.the.time. Either they’re too small and dinky, or they’re ginormous. The rule of thumb is to have your table be 1/2 the length of your sofa, and then within 4″ higher or lower than the height of your sofa. Also, look at all of the shapes in your room. 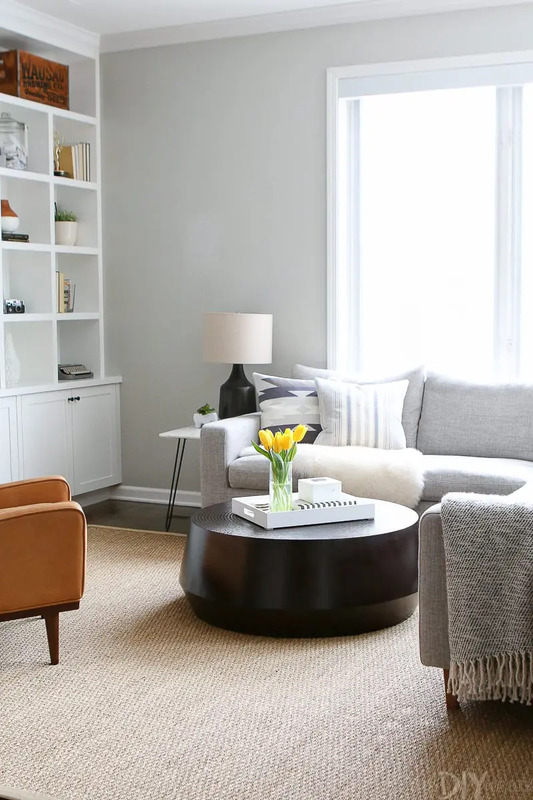 If you have a lot of straight angles, you may want to opt for a round coffee table to break up all of those straight lines (as Casey did with her coffee table). 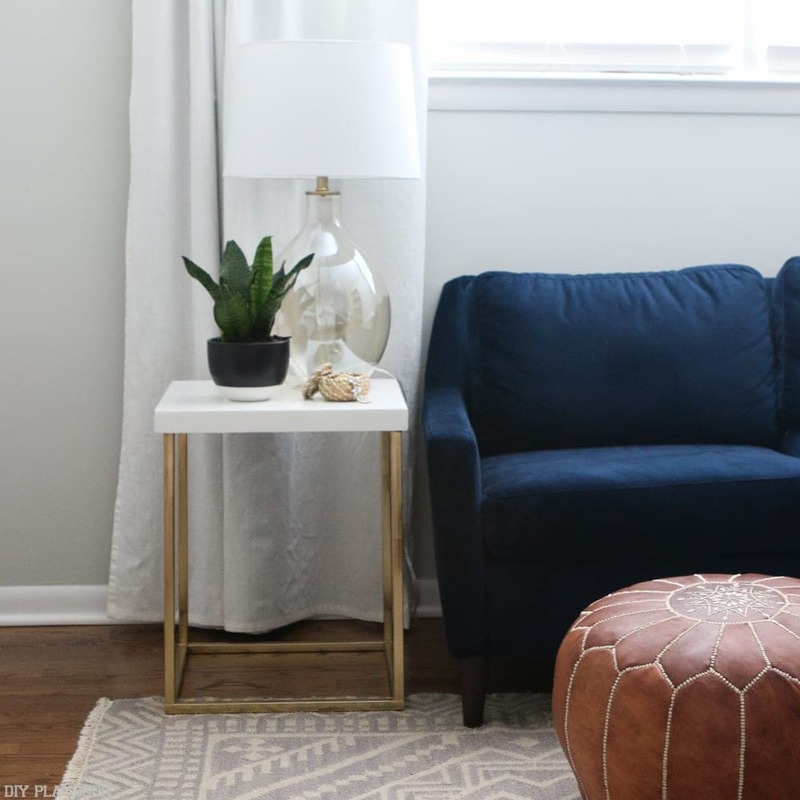 Incorporate Side Tables – A lot of people forget to add side tables to their living rooms, but we think it can add so much to a space. First of all, it’s a great spot for you to rest your drink (bring on those cocktails! ), but it’s also the perfect area for a table lamp (more on that in a minute). Consider adding a table to at least one side of your sofa, just make sure it’s not deeper than the depth of your couch. 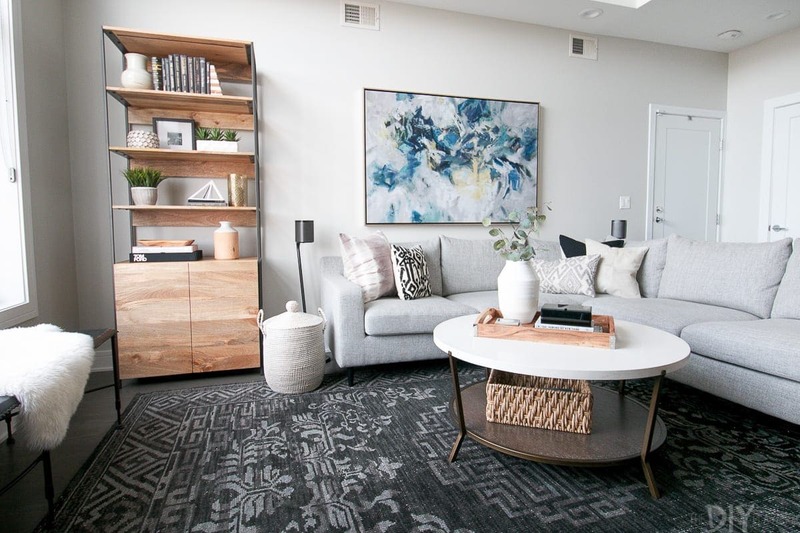 Think of a Console Table – Another table you may want to add to your space is a console table, especially if your couch is “floating” in the middle of a room. We added one in my mom’s living room and it hides the back of the couch, while providing another great spot to display pretty items. For sizing, make sure it’s the same height or a few inches shorter than the back of your couch. And if you can, leave about 6″ of space on each side. Keep the Matching Couch Pillows – You know those “free” pillows that came with your couch? Now is the time to donate those…forever. Please don’t use those on your sofa (here’s an entire rookie mistake explaining why). Instead, change up those pillows in terms of color, texture, and pattern. We have an entire post with tips on how to do just that. Trust us on this one. Buy a Living Room Set – We know it’s easy to just head to a furniture store and buy an entire matching living room set. Again, please don’t do that! You’re missing out on the opportunity to create an interesting and layered space. Incorporating different shapes, fabrics, and wood tones is the best way to build a beautiful living room. More details on why matching furniture is a big no-no in this rookie mistake. Forget Lighting – Lamps are a must for any living room! 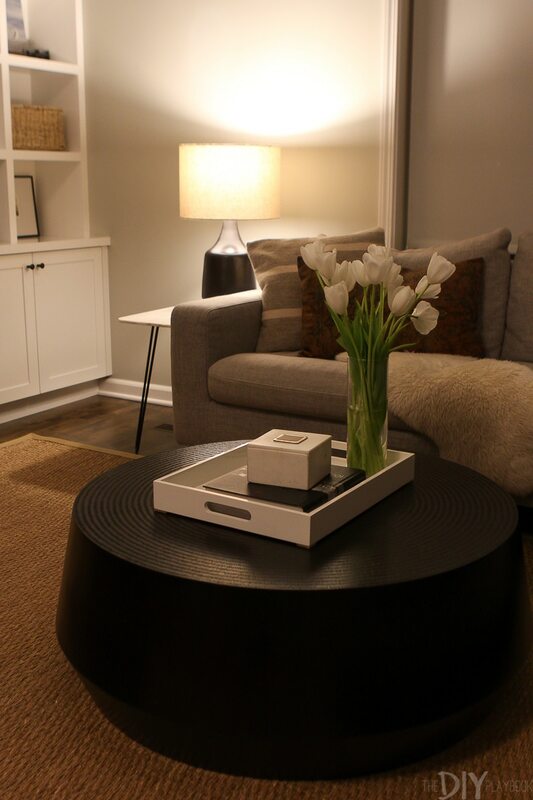 Definitely don’t forget to add table lamps or floor lamps to your space. Just be sure that the bottom of the lampshade is about eye level when you’re sitting on the couch (or else you’ll have a bright lightbulb in your eye!). This post outlines lots of tips for layering lighting. Neglect Walkways – This is an easy “rule” to mess up. You definitely want to leave enough room to walk between all of the furniture in your living room. A good estimate is about 16″ to 18″ between the the sofa and coffee table. Save those shins from bumps and create walkways in your living room! Do the Hot Dog Fold – One of our most popular rookie mistakes of all time was when we discussed the “hot dog fold” when it comes to throw blankets on a couch. It was hilarious the number of people who reached out to say they’ve been doing the hot dog fold forever and were eager to change their ways. Instead of doing that fold, we suggest keeping your blankets in a basket, folding it neatly on the side of the couch, or draping it. This post showcases the fix for the dreaded hot dog fold. Neglect Scale for Art + Shelves – Another thing we see frequently is too small art or shelves over a sofa. We get it, finding the right piece for over a couch is tough! But please don’t add a small frame up there and call it a day. Or worse yet, a tiny shelf that has a few small objects on it. 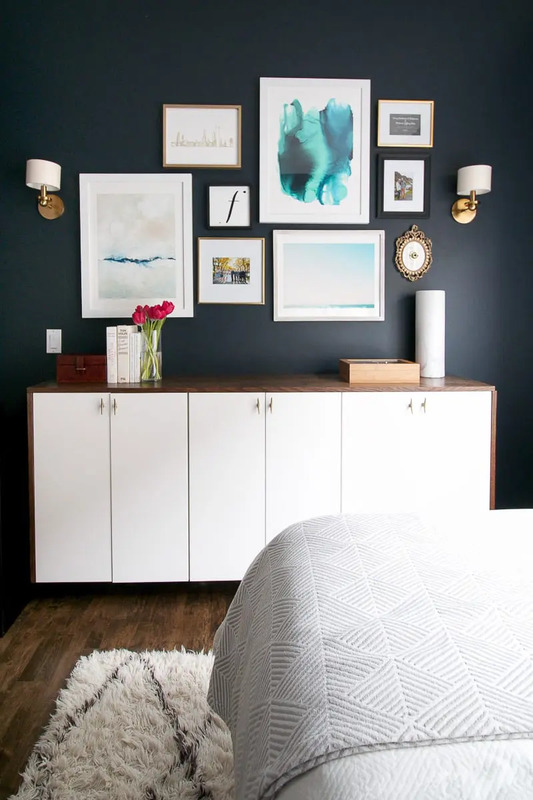 Instead, make sure your art is large enough and is hung at the proper height. In Bridget’s old house, she opted for 2 large frames that are proportioned perfectly. In her current house, her DIY picture ledge works wonderfully! Now, where should you spend the most money in your living room? And where can you save a few bucks? 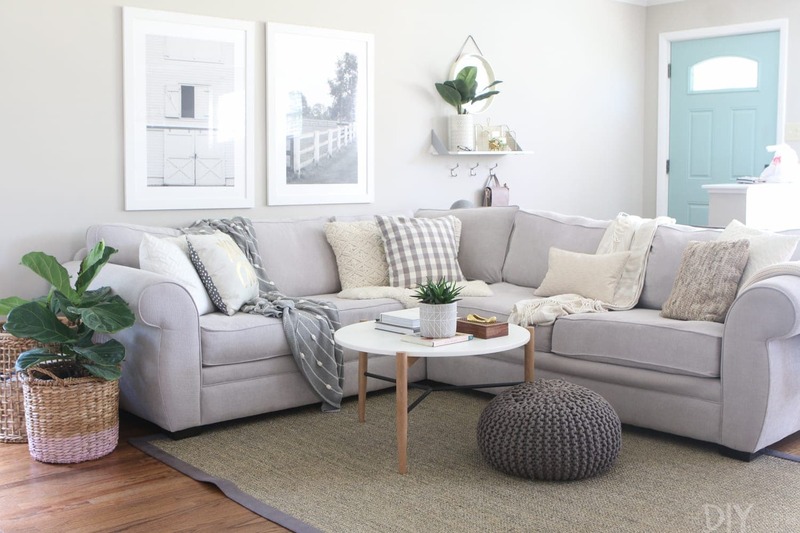 The biggest investment in a living room will likely be your sofa and that’s a-okay! If you’re going to be sitting on it every single day then it better be comfy. Another place we suggest splurging is on secret storage. 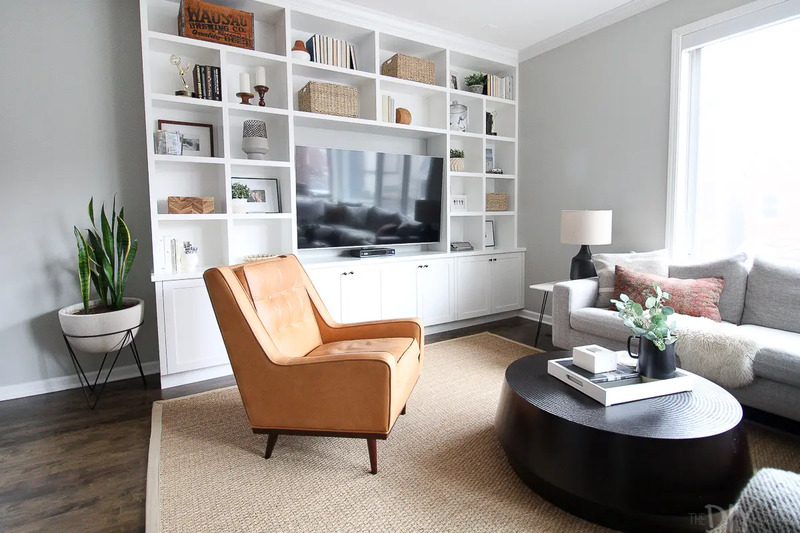 Custom built-ins are expensive, but they can make a living room! Plus, they’re chock full of storage. If you don’t want to install permanent built-ins, then a nice entertainment center is a good idea. Most of the other items in your living room don’t need to break the bank. 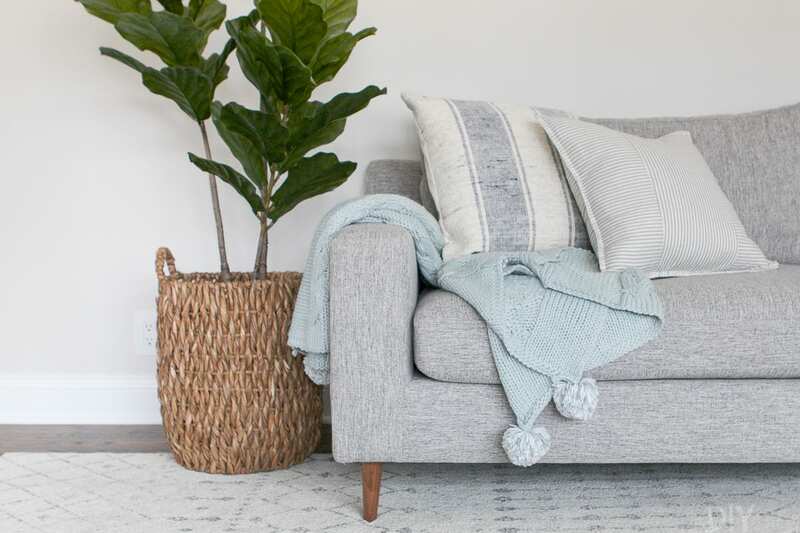 Accessories, throws, pillows…we most always buy those items at HomeGoods and Target. Or you can even DIY a few items like this marble side table. In terms of spending lots of money on a rug, it really depends on your lifestyle. Natural fiber rugs are incredibly inexpensive and you can buy large ones for a great price. 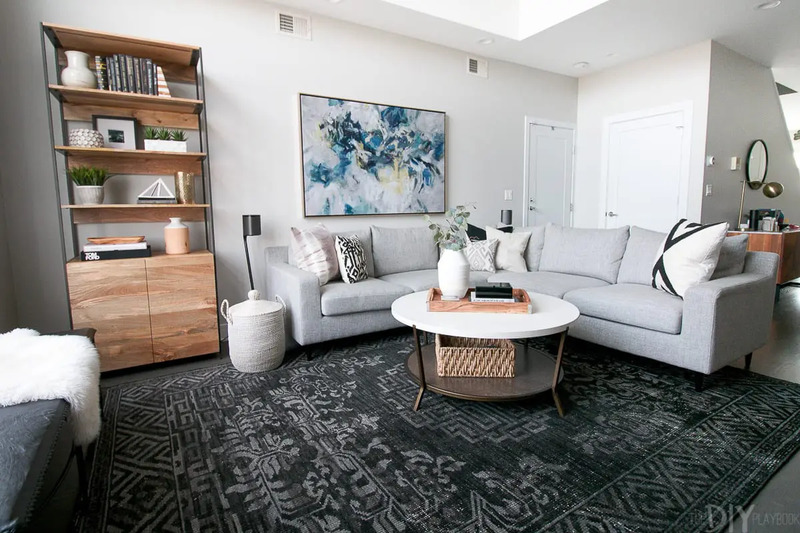 Since you’ll likely need a large rug for a living room, you may not want to fork over tons of cash for a super expensive and higher quality rug. 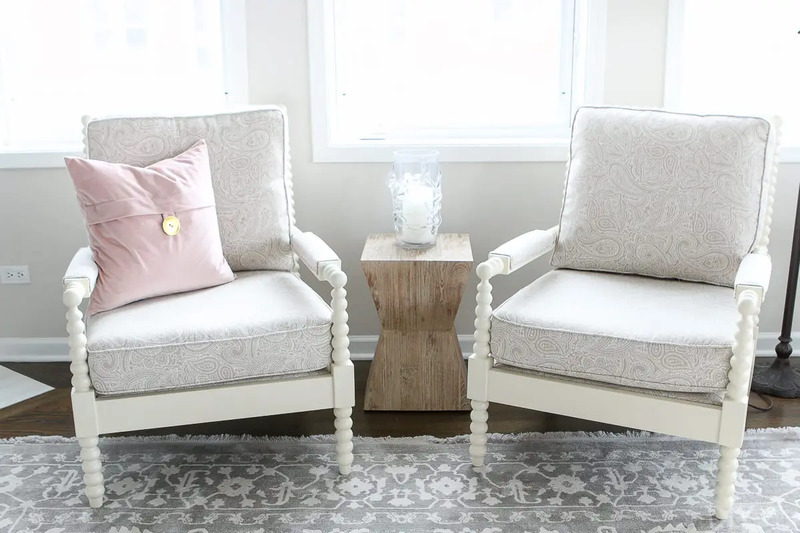 Here are some of the pieces we both use and love in our own living rooms! 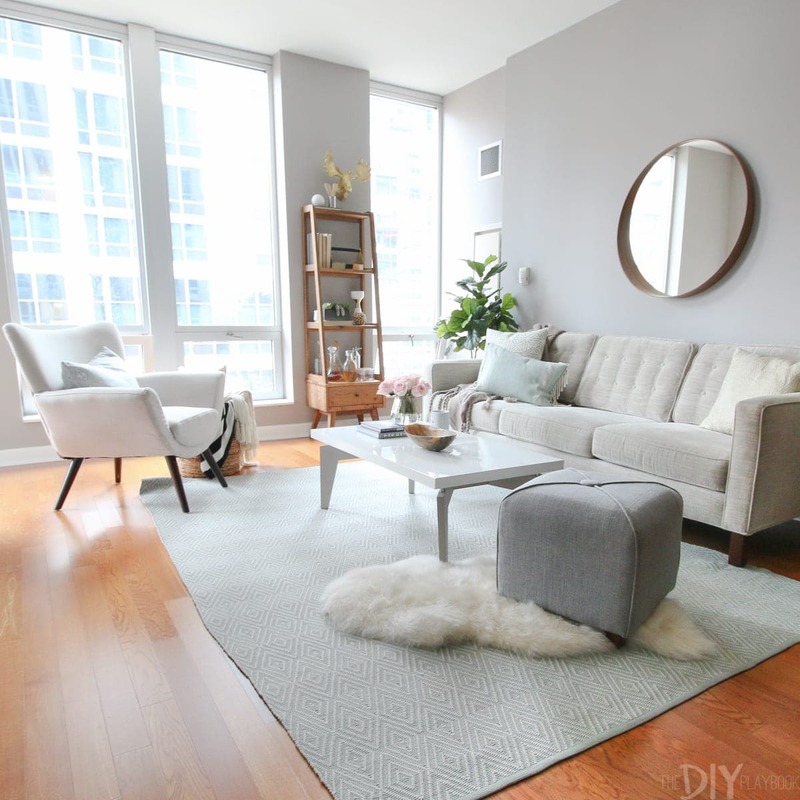 Bridget’s Gray Area Rug: An amazing price point for such a large neutral rug. 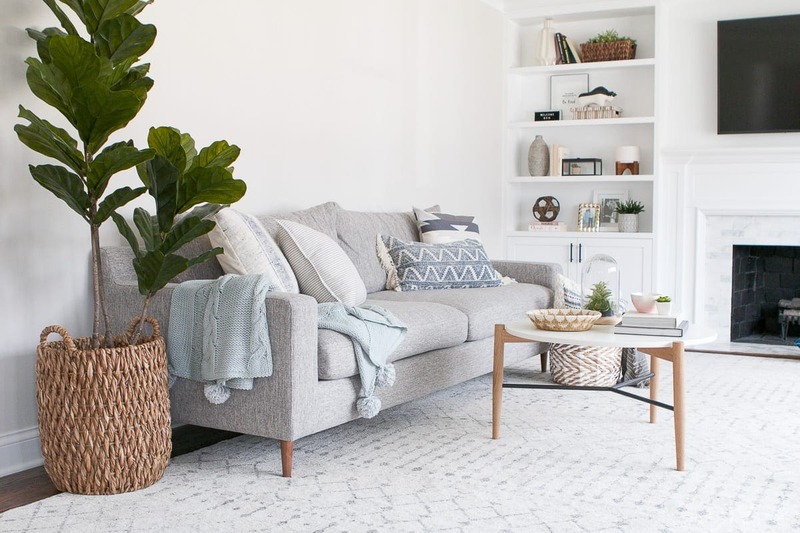 Jute or Seagrass Rug: This post highlights the differences between natural fiber rugs, but you can’t go wrong with either jute or seagrass. Such a family-friendly rug option. Table Lamp: This is the lamp in Casey’s family room and it could work in just about any space. Great quality and style. Basket: We used this basket to store blankets in Casey’s brother’s living room, but if you’re lucky you can sometimes find similar ones at HomeGoods. If not, this one is gorgeous too! Wood Bookshelf: If you don’t have built-ins, this wood bookshelf offers storage on the bottoms and areas to display accessories up top. Sheepskin: We both display sheepskins on our couches to add texture and coziness. Planter: Greenery is a must in every room in your house. Casey’s planter is a fan favorite! Sloan Couch: We both own and love this couch from Interior Define. Sectional: If we were going for a super comfy sectional, we’d buy this one! Tray: Use this to corral items on your coffee table. These ones from West Elm are fantastic. 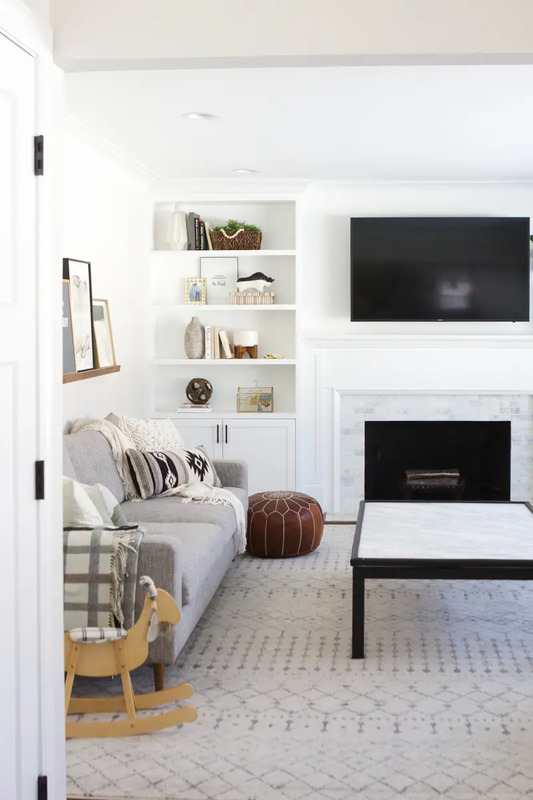 We hope this post will act as a helpful resource as you tackle your own living room decorating. With a few small tweaks, you can create the space of your dreams.